The first thing that strikes me about the two lists is how Caltech can be 10th in the first list and 1st in the second list. But, also, how consistent the two lists are in terms of their top 10. Of the top 10 universities in the first list, 8 are also in the top 10 in the second list, drawn up by an entirely different organisation. What this probably illustrates is that the differences between the top 10, or even the top 15 universities in the World are minimal, and depend on exactly what is assessed and what weight is given to each element of the assessment. When I was applying to university in 1981, the only criterion used for the assessment of a university or a department was its research. I had a lot of pressure put on my to apply to either Oxford or Cambridge, as I was deemed to be “Oxbridge” material. I was not keen to go to either, and thankfully for me I found out that the top rated Physics department in the UK at the time was neither Oxford nor Cambridge, but was Imperial College London. I applied to Imperial, without applying to either Oxford or Cambridge, and it was at Imperial I studied my Physics degree. I found it interesting when I arrived there to discover that about 50% of my class-mates had, like me, chosen Imperial above all others; and the other 50% had failed to get into Cambridge (I don’t remember anyone being an Oxford reject). Nowadays, things have broadened in terms of how departments and universities are assessed. In addition to research reputation, other factors such as teaching quality, staff to student ratio, library and sporting facilities, student accommodation, diversity of students, cost of living etc are also taken into consideration. But, I would wager that the top 15 universities in the World, as assessed by the various organisations who compile such lists, has probably remained largely unchanged over the last 30 years. In 1993-94, I was lucky enough to spend a year lecturing at Swathmore College in the USA. I must admit, prior to applying there for a job, I had never heard of the place. It turns out it is one of the top 3 private liberal arts colleges in the US. Along with Williams and Amherst, Swarthmore seems to be perennially in the top 3. Certainly I was taken aback by the quality of the students who attend Swarthmore, they had all graduated top of their high-school classes, and had chosen Swarthmore rather than Harvard of Yale or MIT or Princeton because of the excellent undergraduate teaching for which it is renowned. It is a very small college, only 1200 students attended when I lectured there, although this has now grown to some 1500. But that is still tiny compared to the 50,000+ undergraduates one tends to find at the larger US universities. A staggering 5 Swarthmore graduates have won a Nobel prize, which given that only some 300 graduate each year, is a truly incredible ratio. I is also, per student, the best endowed higher education institute in the World. How I wish the Dinsunited Kingdom had undergraduate teaching colleges/universities of such quality. 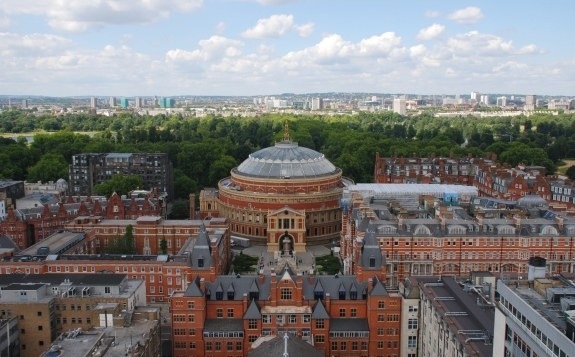 Imperial College London, my alma mater.